Click on the link above to chat with us in real time about our Internet cafe software solutions. Join our discussion forum to help other users answer their questions about our Internet cafe software or simply to post a query to us and the many users of our cyber cafe software who regularly take part in our online discussions. We regularly post articles about our Internet cafe software products and services along with news about the cybercafe and callshop markets on blog pages available by clicking the icon 'More info'. Click on the more info button below to view a slide show showing all the main interfaces of our cyber cafe pro software along with a short description of the key features. Our cyber cafe software has already won many awards by well-established shareware sites on the Internet and is the official partner and supplier of numerous cyber cafe and gaming centers and organisations. Please note: We wish to make the buying experience as secure as possible for both you and the credit card holder. It is pointless trying to submit a purchase with a card that does not belong to you. All purchases are thoroughly cheched and we send an activation key by email that can be disabled should the purchase be found to be fraudulent. Thank you. The Pro version of our cyber cafe software offers a high quality product that is competitively priced: up to 70% cheaper than other cybercafe programs, many with fewer features. The current price is a one-time fee of GBP49 (USD75-EUR59) for 10 PCs + the control station. Additional PCs are GBP3 (USD4.50-EUR3.75) each. None of our prices attract VAT as we are based in Europe but outside the EU. Save another GBP10 (USD15-EUR12.50): Download our cyber cafe software's pro version, register your copy with a valid email address, wait until you receive our email alert (typically 7 days later) and claim another GBP10 (USD15-EUR12.50) off the normal price by following the instructions in the email! Offer is valid for 48 hours after receipt of the email alert. Payment through these online services can be done through one of their accounts, by bank transfer or by using any valid credit card. The only fee-paying services offered to users of our cyber cafe software's free version are the support services detailed in the price table at bottom of form. Simply click on the Paypal or Skrill icons at bottom of page. You will then see a separate window to enable you to select the quantities wanted. Go to the view cart icon in the left-hand side menu then press the checkout button in the Paypal or Skrill window when done. Finalize your purchase in the Paypal or Skrill browser window. Go to Paypal and Skrill order form - Click here. Other payment methods we accept are via money or bank transfer. Please turn to the FAQ for more details on these methods. Click on 2nd link of the FAQ. 4.1.1. I wish to buy the Dynasoft Cybercafe SurfShop Pro server software and ten client licences. Ten is the minimum number of client licences available with our product. Add more PCs to your order using the third item under this heading - Price: GBP49 (USD75-EUR59)(*). 4.1.2. I wish to buy a hardware dongle key because I do not have a permanent connection to the Internet and wish to avoid having to manage my own Internet-based activation key (**) - Price: GBP69 (USD99-EUR84). 4.1.3. It is possible to use 10 client PCs with the basic licence of SurfShop. However, I require additional client licences because I wish to add more PCs to my business - Price: GBP3 (USD4.50-EUR3.75). 4.2.1. Pro customers benefit from 30-days' free support and all the means required in order to manage their activation keys. Click this button if you need a one-time retrieval of your key in case of a loss - Price: GBP24 (USD36-EUR29). 4.2.2. I need year-long support for my software: Dynasoft Cybercafe SurfShop Pro & Free software support service (***) - Price: GBP99 (USD149-EUR124). 4.2.3. Worried about losing your data over a system crash? Take out our unique data recovery service and we will send you all your system data back by email for a year. Privacy, data protection and confidentiality are guaranteed - Price: GBP69 (USD99-EUR84). 4.2.4. Just send me the most recent copy of my database for a one-time fee. Specify name of shop/business as it appears in your Dynasoft Cybercafe SurfShop Pro or Free licence form - Price: GBP34 (USD49-EUR42). 4.3.1. 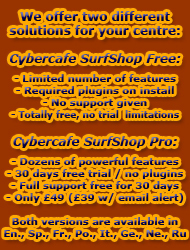 I already am a customer and wish to receive a key for the latest version of Cybercafe SurfShop Pro / Offer. Purchase the number of client PCs required above 10 PCs under §.1 above - Price: GBP29 (USD44-EUR35). 4.4.1. I wish to buy some training on the software. Get 2.5 hours of dedicated training with one of our team during which we cover all aspects of the software and how to use all its features - Price: GBP149 (USD219-EUR179). (*) Our main currency is GBP. USD and EUR amounts are only given as an approximate estimate the GBP amounts correspond to. (**) This includes carriage and is not necessary if you choose the Internet-based activation key and have a permanent connection to the Internet on the server. Please note a dongle does not include a server licence of the software. (***) This service enables you to have for one year, free upgrades and support via VPN/email for your copy of SurfShop. We also will send you your activation key free of charge should you lose it. Download our support SLA here. © 2007 - 2019 Copyright Dynasoft Ltd - All rights reserved. Concevons compteur cybercafe et compteur pour cybercafe, mais aussi un compteur pour cybercafé pour la gestion cyber cafe. Permite controlar cybercafes. SurfShop is a net cafe software and cafe internet software designed as a timer software for internet cafe and billing software for cyber cafe.